Life, it has often been said, is one big journey, and that’s even more the case when you are a top-flight DJ. Using data scraped from Resident Advisor event pages*, web developer Elliot Matthews has discovered the DJs that performed the most gigs over the past year, and whose carbon footprint, we suspect, will take a good deal of offsetting. Matthews is also the creator of immersive event brand, Trippy Visions (visit www.trippyvisions.com to find out more) as well as a new nightlife social media platform, www.outout.info. As the data below indicates, German duo Âme racked up the most gigs last year, with a total of 159 shows – that’s one every 2.29 days. Hot on their heels is nascent techno goddess Charlotte de Witte, who played 153 gigs last year (up from 113 in 2017 and just 38 in 2016), and Belgian compatriot Amelie Lens, who had 147 gigs last year (up from 95 in 2017 and 49 in 2016). Gerd Janson (144 gigs in 2018) and Claptone (140 gigs) round off the top five, while the top 20 reads like a who’s who of dance music at present, notable entries include Pan-Pot (138 gigs), Mall Grab (127 gigs; up from 52 in 2016), Nastia (125 gigs), Peggy Gou (123 gigs; she played just 46 gigs in 2016), Sven Vath (118 gigs), Marcel Dettmann (117 gigs), Nina Kraviz (115 gigs) and Ben Klock and Horse Meat Disco tied for 20th position with 114 gigs each. 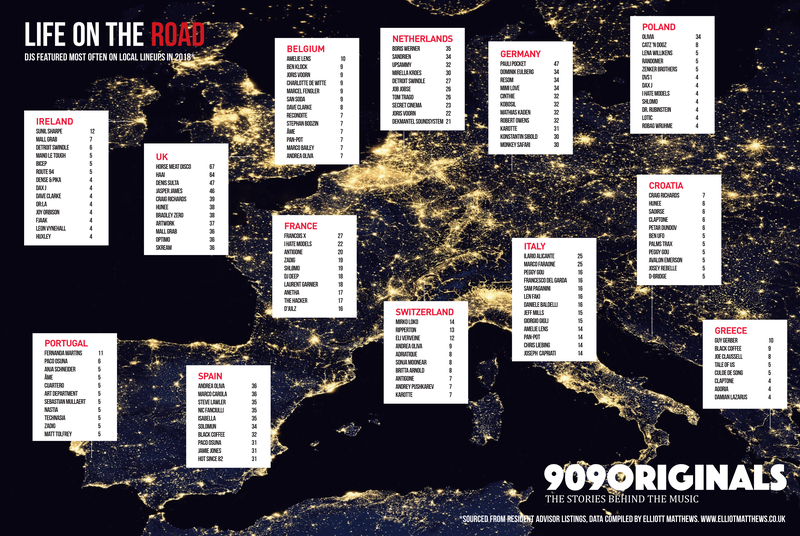 Looking at Europe as a whole, the data also shows which big name DJs play most often in which countries – 909originals has developed a special infographic below [infographic will open in a new tab] with a breakdown of some of the continent’s key clubbing destinations. As you might expect, several of the DJs occupying the top position are native to that particular country – hence Francois X comes out on top in France, ditto Sunil Sharpe in Ireland and Ilario Alicante in Italy. We have included the top ten in each country, or where tenth place is a tie, included all the DJs that fall into tenth position. Nonetheless, the data gives an interesting perspective on the ‘journeyman’ nature of the modern DJ..!